The R&S®SMW200A vector signal generator is the ideal tool for generating the high-quality, complex digitally modulated signals required for the development of new wideband communications systems or the verification of 3G and 4G base stations. All functions needed are combined in a single instrument: baseband (up to 160 MHz bandwidth, maximum of eight baseband sources), MIMO (up to 8x2 without external add-ons, easy-to-use 4x4 solution), fading (with up to 16 logical faders), AWGN and RF, and all this twice in two paths up to 6 GHz each, plus internal signal calculation. Despite of its impressive scope of functions, the R&S®SMW200A can be operated very conveniently and efficiently thanks to its intuitive touch GUI and many powerful assistance tools such as a testcase wizard, a macro recorder for automatic generation of SCPI remote control programs or the context-sensitive online help. The instrument is completely modular. In the simplest case, you start with an externally modulated (up to 2 GHz bandwidth) RF generator. Finally, you might end up with an instrument capable of simulating multi-user PUCCH for LTE or even generating LTE-Advanced scenarios with carrier aggregation and all MIMO configurations defined by the standard. Whatever goes up on your drawing board: The R&S®SMW200A will help make your visions come true, now and in the future. Simulation Modes and GUI. In this second video of R&S’s new video series on high-end GNSS testing, it is shown how to work with the instrument. MCMF capabilities, on-the-fly changes and monitoring features. In this third video of R&S’s new video series on high-end GNSS testing, it is shown how to set up a multi-constellation, multi-frequency GNSS scenario and feed the GNSS signals to a connected GNSS receiver. Rohde & Schwarz demonstrated a unique solution for testing wideband signals at millimeter frequencies with reduced hardware complexity, at the GSMA Mobile World Congress 2016 in Barcelona. Based on the R&S®SMW200A vector signal generator and the R&S®FSW signal and spectrum analyzer, the test solution can generate and analyze signals with up to 2 GHz bandwidth in the 60 GHz frequency range which will be used in 802.11ad Wi-Fi and 5G wireless connections. Test scenarios can range from simple pulses for component tests to full scale testing of complex radar systems. Examples show how to map real signal environments with multiple emitters and interferers into vector signal generators to stimulate a system under test. Simplified power amplifier (PA) characterization including envelope tracking and digital predistortion has been demonstrated by Rohde & Schwarz at the GSMA Mobile World Congress 2015 in Barcelona. The test solution is based on the R&S®SMW200A vector signal generator and the he R&S®FSW signal and spectrum analyser. 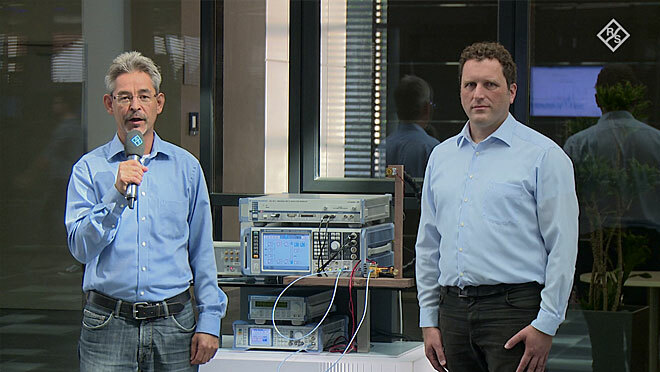 Rohde & Schwarz demonstrated a test setup for broadband 5G applications in the millimeter wave range at the GSMA Mobile World Congress 2015 in Barcelona. The setup based on the R&S®SMW200A vector signal generator and the R&S®FSW signal and spectrum analyzer can test bandwidths up to 2 GHz, which is 100 times larger than in current LTE networks. Writing the remote control program for T&M equipment can mean tedious work - but not with the R&S®SMW200A. The R&S®SMW200A vector signal generator allows creation of remote control routines in an especially easy way. You simply start the macro recorder and operate the R&S®SMW200A as usual. The macro recorder logs your inputs and the resulting SCPI remote control program can be exported -- or used to perform tests with the R&S®SMW200A. Highly developed standards such as LTE and WLAN 802.11ac presuppose MIMO. MIMO testing requires a signal generator with multipath and standard-compliant fading simulation in all signal paths. The R&S®SMW200A vector signal generator can internally simulate all MIMO constellations up to 8x2, including fading. LTE base stations need to be tested in line with the base station conformance test specification 3GPP TS 36.141. For easy test signal generation the R&S®SMW200A vector signal generator features an LTE test case wizard, which is demonstrated in this video. The whole signal setup including the correct LTE settings, leveling, interferer simulation, fading and trigger configuration are done by push of a button. Modern mobile devices and base stations need to cope with varying transmission conditions. A received signal is distorted by interference (e.g. from other devices/base stations close by), additional noise (e.g. receiver noise) or fading (due to receiver movement). The R&S®SMW200A vector signal generator can internally simulate all these effects and hence offers a cost-effective solution for testing the behavior of devices under realistic conditions. The R&S®SMW200A vector signal generator is the ideal tool for generating the high-quality, complex digitally modulated signals required for the development of new wideband communications systems or the verification of 3G and 4G base stations. This video shows how easy it is to set up an LTE signal. No matter if single-carrier LTE or LTE-Advanced carrier aggregation needs to be generated - the intuitive user interface allows straight-forward configuration of the desired test signals. Rohde & Schwarz showcased a compact LTE 4x4 MIMO test solution at the GSMA Mobile World Congress 2014 in Barcelona. Based on the new high-performance R&S®SMW200A vector signal generator and the R&S®RTO digital oscilloscope, the solution provides MIMO signal generation and realtime channel emulation (up to 4x4 or 8x2) as well as synchronous analysis of multiple TX antenna signals. This setup is also the basis for 2x8 LTE base station receiver testing.